Rich in iron, selenium, protein, dietary fiber, and vitamins C and B-complex, research has shown significant benefits to incorporating shiitake mushrooms into your diet (and your skincare regimen). Shiitakes are a versatile low calorie food that can be eaten raw, cooked or dried, however raw shiitake mushrooms offer the largest number of health benefits. Cooking shiitake depletes some of its nutrients, but if you are new to this mushroom, I recommend you cook them first to get accustomed to their flavor before advancing to raw consumption. With their rich, smoky flavor and meaty texture, they’re an easy way enhance a basic dish, but first let’s explore what the shiitake mushroom health benefits are. Shiitake mushrooms are one of those high antioxidant foods. They contain a powerful antioxidant, L-ergothioneine, which helps the body ward off free radicals, a key to cancer prevention. Research indicates that mushrooms contain higher concentrations of this antioxidant than chicken liver and wheat germ, which previously were believed to contain the most. While research is ongoing, the American Cancer society notes that shiitake mushrooms seem to have anti-viral and anti-tumor effects, which might be due to their ability to boost the immune system. They contain a compound called lentinan, which has been shown to strengthen the immune system, reduce and slow the growth of cancer cells, and fight tumors by activating cells that attack cancer. Shiitake mushrooms contain a substance called eritadenine, which encourages body tissues to absorb cholesterol and reduces blood cholesterol levels. Now that you know some of the benefits and are interested in adding them to your diet, what do you do with them? Select fresh mushrooms that are firm, plump and free of bruises. Avoid soaking them in water as they absorb water easily and will become soggy. Instead, wipe them with a damp paper towel to remove dirt. To retain nutrients and maintain flavor, sauté mushrooms in olive oil for a minimum of 5 minutes. 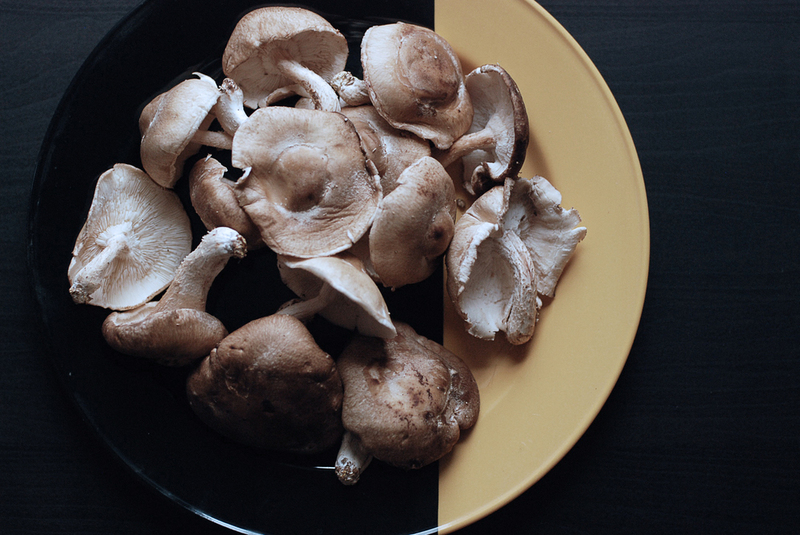 Try adding shiitake mushrooms to soups, stir-fries, omelettes, and even as a side dish. Heat oven to 425 degrees. Cut 4 pieces of parchment paper, approximately 12x16 inches each. Fold the paper in half and trace half a heart shape. Cut out the shape and open to reveal a heart-shaped piece of parchment paper. Spoon ½ cup brown rice onto one side of the parchment paper. Top with mushrooms, thyme, sage and oregano. Season with salt and pepper and drizzle with olive oil. Close the parchment paper and begin working from one end, tightly folding the open edge of the paper to form a seal, tucking in the tail end. Transfer packets to the oven on a rimmed baking sheet and bake for approximately 20-25 minutes, until packet is puffed and mushrooms are cooked through. Cut open the packets, and serve the crispy rice blend with micro-greens, parsley, lemon wedges and a touch of parmesan. If you want to make one major food-related resolution for 2015, then consider eating more shiitake mushrooms. You'll feel better knowing that you've added antioxidant rich foods to your diet, while at the same time making your everyday dishes more flavorful and unique.